Asustek Computer unveiled a novel laptop-tablet design at the Computex trade show in Taipei on Monday, along with an all-in-one PC with a detachable monitor that transforms into "the world's biggest tablet." The hybrid device, called the Taichi, looks at first glance like standard thin-and-light laptop, with a sleek black exterior. But the outside of the display is actually a second, touch screen display. When the laptop is closed and the outer display is activated, it looks and operates like a tablet PC. When the laptop is open and the outer display is activated, two people can view the same desktop image even when they're sitting on opposite sides of a desk. "Not that there's anything wrong sitting next to each other, but this looks much better," said Asus chairman Jonney Shih, who introduced the Taichi at a press conference the day before Computex officially begins. The Taichi was shown running Microsoft's upcoming Windows 8 OS, expected to be released later this year. It will run Intel's latest Core microprocessors and be offered with screen sizes of 13.3 and 11.6 inches. The Taichi is "as thin and light" as Asus's current Zenbook ultrabooks, Shih said. He didn't give a price or an exact shipping date. He also introduced the Transformer All-in-One. With an 18.4-inch screen, the PC looks like a traditional all-in-one desktop but has a few twists that make it unique. The display has a touch screen and can be detached from the body and used separately, prompting Shih to declare it the world's biggest tablet, as he carried across the stage under his arm. It also runs dual operating systems, Windows 8 and Android. In Windows 8 mode the display can be used as a remote desktop, communicating wirelessly with the base. Running Android it operates independently as a tablet. However, there are some kinks to work out. Shih couldn't get the display to operate remotely, and as he fumbled with it an error message appeared that declared "this app cannot open." He gave up and moved to the next product. Also shown was the Asus Tablet 810 with an 11.6-inch screen and the Windows 8 OS. The tablet runs on Intel's next-generation Atom processor, though Asus did not provide further chip details. 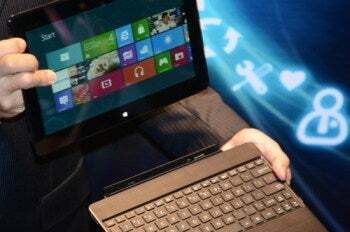 Intel is scheduled to release an Atom chip code-named Clover Trail in time for release of Windows 8 tablets. The 810 has an optional dock with a full QWERTY keyboard and a built-in battery for extended run time. Shih also introduced the Tablet 600, which has a 10.1-inch screen and runs Windows RT on an ARM-based Nvidia Tegra 3 processor. 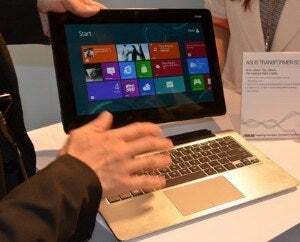 Asus also introduced the Asus Transformer Book, a convertible notebook with a detachable screen. Much like Samsung's Series 7 Slate, the touchscreen can be detached from the laptop to run in tablet mode. The PC runs on Intel's latest Core processors code-named Ivy Bridge. Asus did not provide availability or pricing information for any of the new products.